A few years ago, Bev Weeks walked up to Patti Horne at a golf event and said, “You know, you look a lot like a sorority sister of mine, Marcia Guest.” Horne replied, “That’s because she’s my sister. To paraphrase the last line from the classic movie, “Casablanca,” that was the start of what has turned into a beautiful golf friendship – one that’s gaining momentum. 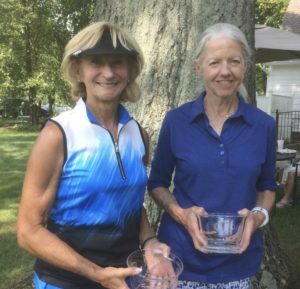 Horne, who plays out of Wyoming Golf Club, and Weeks, a TPC River’s Bend member, teamed up on August 14 to edge Mardie Off and Lynne Schneebeck and capture the First Flight Low Gross championship in this year’s sold out Crystal Bowl tournament at Camargo Country Club. Both teams finished at 79, but a Horne-Weeks birdie on the 17thhole was the tiebreaker that clinched the championship. That wasn’t the only tight finish. 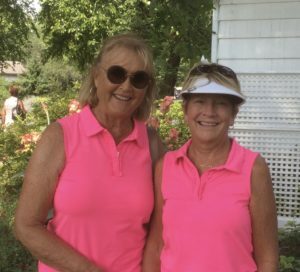 The team of Jane Taylor and Dodi Corbett, playing out of Triple Crown Country Club, needed a tiebreaker to get past the team of Nancy Morrissey and Pat Balash after both duos finished at 66 in the Second Flight Low Net competition. By comparison, the other outcomes were relative blowouts. 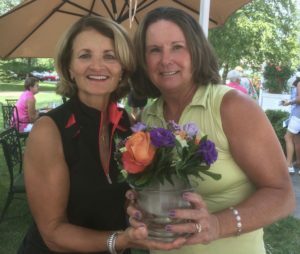 Jody Rusche and Trish Doyle teamed up to finish the First Flight Low Net tournament with a 64, three strokes ahead of Lisa Consolino and Debbie Lach. 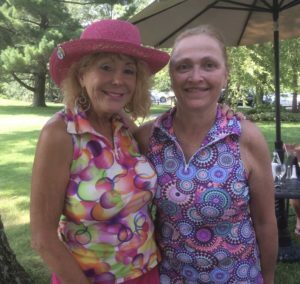 Carol Sarver and Linda Pulasky combined to shoot an 87, two strokes better than Patti Bracken and Donna Schmidt in the Second Flight Low Gross event. Sarver won a Crystal Bowl with Deb Altman two years ago, she said. She couldn’t trace this year’s win to any particular aspect of her and Pulasky’s games. Taylor and Corbett also were part of a foursome that needed a tiebreaker to squeeze past a team that included Morrisey and Balash and win the Kent Memorial High Net title on July 26 at Hyde Park. The Crystal Bowl was the first time Taylor and Corbett had ever played Camargo. They were one of two Triple Crown teams to compete. One of the women got up right after midnight on the first day golfers could register for the tournament to make sure they got in, Taylor said. “I really enjoyed getting to play Camargo,” Taylor said. “Our incentive for signing up to play the event was we had never played there. We hadn’t thought about winning anything. We just wanted to enjoy the day. We were very thrilled to win. “Dodi and I just kind of ham-and-egged it. One of us would play bad on one hole and the other one would play well and then vice versa. We were shocked that won.” Taylor’s team had an unusual good luck charm. A birdie on the 17thhole proved to be the difference for Horne and Weeks in their Low Gross win over Off and Schneebeck, who were playing on their home course. USGA tiebreaking procedures call for ties to be broken by comparing the tied teams’ scores hole-by-hole, starting with 18 and working backward, Horne said, quoting Camargo pro Tom Cecil. “We just zigged and zagged very well,” Horne said. “Bev is a strong player. She has a lower handicap than I do. We thought we kind of blew it on the front nine. We had two double bogies in a row. That was problematic. We only had two bad holes, but they were really bad. We thought we’d blown the Gross, but we might still make Net. We recovered for the three or four holes we had left, but we were still quite surprised that we tied for Gross.